The Trump administration’s National Security Strategy (NSS) characterizes China as a “revisionist power” that is “attempting to erode American security and prosperity” and “shape a world antithetical to US values and interests.”1 The accompanying National Defense Strategy (NDS) adds that Beijing seeks “veto authority over other nations’ economic, diplomatic, and security decisions” and is modernizing its military in pursuit of “Indo-Pacific regional hegemony in the near-term and displacement of the United States to achieve global preeminence in the future.”2 It is true that China represents an unprecedented strategic challenge to the United States and its allies, especially within East Asia. But these documents reflect a stereotype of Beijing and little effort to understand what actually motivates Chinese behavior. Moreover, preoccupation with China as a traditional, Cold War-style ideological or security threat is hindering both an accurate recognition of the nature of the China challenge, and the development of a thoughtful strategic response to it that effectively serves US and allied interests. By misidentifying what China is fundamentally about, the NSS and NDS risk leading Washington down a path that is misguided, prohibitively expensive, and counterproductive. There can be no doubt, as Henry Kissinger observed in a 2015 interview, that “China inherently presents a fundamental challenge to American strategy.”3 But contrary to the prevailing narrative, that challenge is not primarily in the traditional security realm, and it is not one against which US material and moral advantages will necessarily prevail. It is neither as ideological nor as existential as the challenge posed by the Soviet Union. However, it will be more difficult to deal with because China—unlike the Soviet Union—is increasingly confronting the United States on its own terms, and Beijing’s international power and influence relative to Washington’s is growing. Dealing with it in a constructive way will require the United States and its allies to better understand why Beijing thinks and acts and defines its interests the way it does. First and foremost, China’s ambitions within East Asia (and beyond) are not really about communism. They transcend the nature of the regime in Beijing, whose foreign policy has long since abandoned any reliance on exporting communist ideology. Even Beijing’s relationship with North Korea is increasingly driven more by raw geopolitics than by shared ideology, notwithstanding their routine rhetorical emphasis on fraternal party ties. Moreover, China’s proselytizing of its development model—“socialism with Chinese characteristics”—has been largely passive. Since the 19th CPC Congress in October 2017, Xi Jinping and other Chinese officials have advertised China’s model as a “new choice” for other countries to adopt4—partly in response to the opportunity to score points in the wake of the Trump administration’s apparent retreat from touting the US model (and the earlier tarnishing of the US model by the global financial crisis). But at a subsequent meeting with representatives from foreign political parties, Xi specified that China was “willing to share” its model but would not “ask other countries to copy” it.5 Indeed, his touting of China’s economic model was probably aimed as much, if not more, at legitimizing it to his domestic audience. The bottom line is that Beijing does not aspire to establish world socialism—as the Soviets did—and instead welcomes peaceful coexistence with democratic capitalist countries. Both before and since the congress, Beijing has emphasized its acceptance of global “diversity” in economic and political systems. Beijing’s role in creating new multilateral institutions centered in East Asia, such as the Asia Infrastructure and Investment Bank (AIIB), reflects this approach because it is aimed at supplementing what China has achieved within the existing order rather than replacing it. China’s “Belt and Road Initiative” to extend its economic role—and by extension its diplomatic influence—across Eurasia should also be viewed in this context. It is simply and predictably capitalizing on its clout and diversifying the areas in which it exercises that clout.7 These are the natural consequences of China’s sheer geostrategic weight and the trend lines of historical change in the balance of power. Notwithstanding US discomfort with those trends and widespread suspicion of Beijing’s intentions, we should not attribute to China “expansionism” or “aggression” what is, arguably, more attributable to the laws of international physics, which are giving it substantially more power and leverage than the rest of the world is used to it having. Third, China’s international behavior is not driven primarily by its domestic politics or leadership dynamics, as is often presumed or portrayed. Internal factors no doubt play an important role in how Beijing conducts itself externally, especially by reinforcing a hard line on sovereignty issues because of the leadership’s obligation to cater to popular nationalism in China.8 But this only reinforces the leadership’s own nationalistic instincts, which have deep historical roots. Chinese foreign policy is also driven in part by the external requirements of sustaining economic growth at home, which is vital to the regime’s domestic power and legitimacy. But this would be natural under any regime, and—contrary to the theory espoused by some observers—Chinese leaders have no history of lashing out externally to deflect attention from internal problems. Finally, China’s external behavior should not be attributed largely—as many commentators have done—to Xi Jinping’s personal agenda or leadership style. Xi inherited the historical and systemic drivers of Chinese foreign policy, and China’s “assertiveness” was well in train before he assumed power, for strategic and other reasons (including reaction to steps taken by other countries) that predated his tenure.9 In short, Beijing’s international behavior is more fundamentally driven by external factors and circumstances—especially China’s perception of its strategic environment—than by internal ones. And focusing on the domestic drivers, however valid they are, risks overlooking or even denying the importance of the external, strategic factors. To fully understand those strategic factors, we need to go further back. The primary and most important source of China’s external behavior is its historical experience in the 20th century—before the communist takeover—and even earlier, which remains deeply resonant today in the mindset of both leaders and the public. No doubt there is overblown rhetoric in the perennial invocation of what is called their “century of humiliation” at the hands of foreign powers, and textbooks are full of selective, one-sided accounts of the period.10 But the elements of truth in China’s account cannot be dismissed either as propaganda or as too long ago to be relevant. Indeed, China’s international behavior today cannot be understood, and devising a response to it will be problematic, without acknowledging the persistent impact of this historical experience. Among the most important aspects of this crucial episode is that it predated both the founding of the CPC and the governance of China by the Nationalist (Kuomintang) Party. The two parties subsequently evolved—and entered WWII—with essentially the same nationalist goal of rectifying this foreign treatment of China and restoring and securing its territorial integrity and national dignity. (This is still reflected today in the fact that China’s claims in the East and South China Seas are virtually identical to—because they are based on—those of Taiwan.) So, contrary to the widespread impression that the CPC somehow invented or contrived Chinese nationalism for propagandistic purposes, the opposite is true: Chinese nationalism invented both the CPC and the Kuomintang, will outlive them both, and some of its complaints against the West and Japan have a legitimate historical basis. No doubt China bears ample responsibility for many of its own problems and failures during the “century of humiliation,” which contributed to its vulnerability to outside influence—and to China’s frustration with itself for having to invite or endure foreign intervention. But this neither invalidates China’s nationalist aspirations to overcome that past, nor erases the historical reality and the continuing impact of what outside powers inflicted upon it. This history is the foundation for what Xi Jinping calls the “China Dream” of “national rejuvenation”—the restoration of China to wealth and power and international respect. But this dream is not unique or original to Xi; his is only the latest rhetorical version of a nationalist aspiration that predates the CPC and the 20th century itself. This history is also why Beijing today is so insistent and assertive on sovereignty issues, and it explains how the Chinese can genuinely view their actions in this regard as reactive and defensive rather than as aggressive and expansionist—as they are generally viewed by other countries. None of this is meant to suggest that China’s sovereignty claims are wholly reasonable, or that China is currently pursuing them in a reasonable way. Many of Beijing’s maritime claims, especially in the South China Sea, have a weak legal and historical basis, and China is pursuing them in obnoxious and counterproductive ways. Nor is it meant to overlook or excuse the nature of the communist regime in Beijing, whose governance continues to violate democratic values and sensibilities. But this history does help to explain why even non-communist Chinese (including students and dissidents resident abroad) are critical of US and allied efforts to push back against China’s sovereignty claims and, more broadly, against its regional and global influence. The Chinese view US policy as aimed at obstructing China’s efforts to restore what they consider their country’s natural place as the central power within East Asia and a great power in the world. After a long period during which China was repeatedly subjugated by foreign powers, this perception is why the Chinese are determined not to remain perpetually subordinate as a strategic player in their own region, or globally. This applies in particular on the Korean peninsula, where Beijing views the US presence and involvement since the Korean War—which the Chinese fought to turn back a perceived US threat to their security—as aimed as much at constraining China’s strategic influence as at containing North Korea. For these reasons, it should come as no surprise that China is inclined to assert itself and exercise its clout as its capability and opportunities to do so grow. That is what has been happening increasingly over the past few decades. Beijing has been immensely successful in transforming the Chinese economy into a global force, which for good or ill has tremendous influence around the world. It would only be surprising if China did not use that long-sought influence to advance its strategic interests and objectives, which include maximizing its wealth and power, ensuring its external security, and burying the “century of humiliation.” Even Deng Xiaoping—who at the end of the Cold War advised that China should “hide its capabilities and bide its time”—would by now be ready to move beyond that guidance, given the current strategic environment and the perceived need and opportunity for China to advance its goals. China’s economic success has also allowed it to greatly enhance its military capabilities, which Beijing has demonstrated its readiness to deploy in pursuit of its interests and in defense of its security. This clearly poses an inherent challenge to the United States and its allies and friends because it potentially undermines their confidence in the security of their interests and in their ability to prevail in a conflict. But an inherent challenge does not constitute a threat, because capabilities do not necessarily reflect intentions. Beijing is at least as averse to military conflict as Washington is, and its acquisition of military capabilities commensurate with China’s size and stature should not be equated with any particular plans for their offensive use, especially against the United States. The Chinese have been building up their military for the same reason most countries do: in case they need it. They will use it when they deem it necessary, but they are not looking for reasons or excuses to do so. Notwithstanding the daunting implications of China’s growing military capabilities, the strategic challenge is not primarily a military one—and, perhaps more importantly, it does not lend itself to military responses or solutions. Recent attention has focused on China’s emerging challenge to international norms. This too is a valid and serious concern, to the extent that Beijing violates accepted principles of international law and practice. But this is a gray area because it remains debatable how systematically Beijing does so, given competing interpretations of international law and the overlap between Chinese practices and those of other countries. China is not alone among major powers in selectively tailoring its compliance with international law to suit its purposes and interests. In international trade, Beijing clearly engages in protectionist and mercantilist behavior, but this is neither unique nor necessarily illegal; and its compliance with WTO regulations can be difficult to assess because of variant interpretations of China’s commitments and obligations.12 Similarly, Beijing’s cyber activities and “influence operations” abroad are alarming in their scope and in the potential threat they present to other countries, but it is not clear what constitutes fair play or standard practice in these realms, and thus how China diverges from it. Finally, although Beijing is clearly advocating “illiberal” ideas and values within the LIO,13 it is not—as noted above—trying to supplant or destroy that order. Instead, it is openly competing to score points within it; and it is worth noting that socialism (or at least central planning) remains viable and even popular in parts of the world, especially in the wake of the global financial crisis. Exposing China’s lack of adherence to rules and norms captures an important segment of the challenge it poses, but not the core element—because China already presents a fundamental challenge to the US and its allies when it is playing by the rules. In sum, China is a challenge to the United States and its allies not primarily because of its ideology, or because it seeks to overthrow the international system or prevail over Washington in a zero-sum contest. Its challenge is not primarily to the US political and economic system or even its military security. Instead, it is—first and foremost—to the longstanding US conception of its role in the international system and within East Asia in particular. China is making a bid for strategic influence, economic and technological advantage, international respect, freedom of action, and accommodation of its interests—all in areas where the United States has long enjoyed preeminent power and influence, and is not inclined to concede it. But China is making this bid on the basis of reasonable great power aspirations, some valid historical grievances, considerable resources, growing confidence, a readiness to compete globally—and, it should be noted, a genuine interest in constructive and cooperative relations. This cannot be obscured or deferred by focusing on the character of the regime in Beijing or on that subset of Chinese behavior that is deemed offensive or unfair. Two relatively recent strategic developments are making this challenge even more difficult. The first is Beijing’s evolving response to US and allied efforts to impose costs on problematic Chinese behavior in an effort to redirect or shape it. Because of China’s growing clout and its perception of growing limits on that of the United States—or on Washington’s readiness or inclination to use it—Beijing appears to be downgrading its estimate of the costs the United States is willing and able to impose on China. For example, Beijing probably increasingly calculates that Washington is deterred from risking conflict with China because of the evolving military balance of power in the region.15 The Chinese appear to similarly calculate that they are well-positioned to inflict reciprocal economic consequences on the United States in the event of a trade war. At the same time, Beijing appears to be elevating the level of costs it is willing to bear in defense of its interests, especially when they involve “core” interests like sovereignty, security, and stability. For example, Beijing appears more than willing to accept the reputational and diplomatic costs of abusing human rights at home and acting coercively abroad. And given China’s growing military and economic clout, it is almost certainly willing to fight for—or weather economic sanctions on behalf of—a “core” interest if deemed necessary. 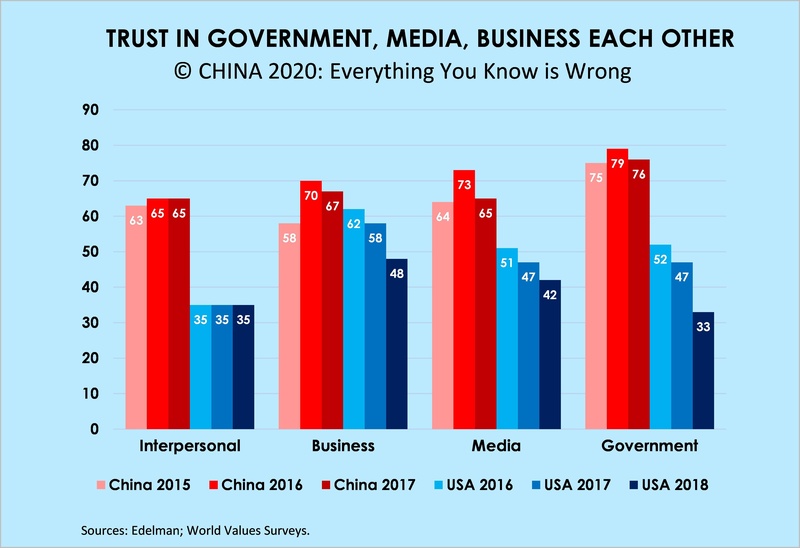 Unless these two trends change, it will only get harder to influence China’s international behavior. In the meantime, Beijing will be playing Washington’s game against it: using China’s levers of power in an attempt to shape US behavior in ways more conducive to China’s interests and preferences. The second development—closely related to the first—is the emerging global perception that the United States itself is preoccupied with political gridlock and economic problems that either reflect relative “decline” or constrain its ability to maintain its attention, commitments, and credibility abroad. Within East Asia, this has fueled concerns about the sustainability of Washington’s attention to the region. This perception predated the Trump administration but has been significantly reinforced by it—especially the withdrawal from the Trans-Pacific Partnership and the general unpredictability of US foreign policy in the region. It also leaves other countries in East Asia more vulnerable or even receptive to China’s diplomatic, economic, and military influence—and, in turn, to Beijing’s efforts to counter US policies that it perceives as aimed at containing China. Many of those countries are already recalibrating their foreign policies with an eye toward relying less on Washington and avoiding antagonistic relations with Beijing. These two strategic trends are reflected in China’s current approach to the North Korea issue. Because Beijing essentially views the United States as a long-term rival for strategic influence on the peninsula, it is applying its levers of power—primarily economic and diplomatic—to ensure China’s role and interests there. It will be calculating—based on its assessment of China’s relative clout—how to shape and if necessary deter or resist US strategic choices and actions on the peninsula. Meanwhile, Beijing will be offering both Seoul and Pyongyang positive and negative incentives to remain attentive to Chinese equities, while seeking to reinforce any uncertainties either of them has about the reliability of the United States as a partner. This challenge need not devolve into a zero-sum contest, and it does not proscribe constructive and mutually beneficial US-China relations that recognize and embrace shared interests. Indeed, it makes pursuit of such a relationship more imperative. But this will require reciprocity, acknowledgment of interdependence, and a better mutual understanding of each other’s strategic mindsets than is now evident. Whether the United States can find a way to address and accommodate China’s regional and global ambitions, and to forge a cooperative relationship despite differences and competing interests, will depend in large part on whether Washington is prepared to accurately understand and acknowledge China’s perspective and the historical bases for it. It will also require the United States to get its own act together and rise to the challenge. As part of this process, Washington needs to recognize and acknowledge the implications for the US role—especially within East Asia—of the historic changes in the regional and global balance of power over several decades. It is not 1945, or even 1991, anymore. The United States faces very different circumstances and a more competitive international environment that requires a fresh look at roles to which it has long grown accustomed.16 Most of the countries in East Asia recognize (some of them uncomfortably) that the preeminent US role there since WWII is a historical anomaly whose rationale and sustainability cannot be perpetual. Washington needs to start thinking about what its role in the region could and should look like over the long term, and developing a strategy that pursues that vision without either inviting conflict or compromising its vital interests and those of its friends and allies. Efforts to sustain an unsustainable or ahistorical US role would probably be counterproductive and fuel regional tensions. Specifically, this will require the United States to recognize and adapt to the growth of China’s influence within East Asia relative to Washington’s—and to the economic, diplomatic, and military leverage that Beijing now brings to bear in its interactions with the United States and other countries in the region.17 Whether or not Washington rhetorically embraces Beijing’s model for a “new type of great power relations,” the United States should embrace much of its substance by pursuing a bilateral relationship that is based on: 2) recognition of US-China economic interdependence; 2) agreement not to challenge each other’s fundamental security interests; 3) readiness to shelve or manage areas where interests diverge; and 4) readiness to maximize cooperation in areas where interests coincide. In his famous “X” article of July 1947, George F. Kennan wrote, “The issue of Soviet-American relations is in essence a test of the overall worth of the United States as a nation among nations.”18 This may apply even more to US-China relations today, precisely because China—unlike the Soviet Union—is competing with the United States largely on its terms rather than as part of a zero-sum ideological struggle. The United States need not fear this competition with China, or reassessment of the US role in East Asia if it retains confidence in American strengths and values. Acknowledging the validity of China’s national interests and its sense of security will not require Washington to endorse the legitimacy of its communist regime, acquiesce to belligerent and coercive Chinese behavior, or surrender the region to an exclusive Chinese sphere of influence. The United States and its allies should maintain their efforts to shape China’s choices, upholding their principled positions on human rights, the use of force, fair trade, and transparency in international affairs; they should also maintain their defensive and deterrent capabilities and a readiness to use them if necessary on behalf of shared interests. At the same time, Washington should not mischaracterize and then oppose China’s aspirations and actions as exclusively the product of authoritarianism or expansionism; and should be prepared to acknowledge when and where the Chinese are competing with the United States naturally and predictably, even when that competition is tough. If the United States accepts and deals and competes with China as a great power, it is well-positioned to maintain and secure its interests while seizing the opportunity to forge a constructive and peaceful—albeit inherently competitive—relationship with Beijing. This of course will also be a test of China as a nation among nations. The differences between the Chinese and US political and economic systems, and in the two governments’ ways of conducting themselves internationally, will continue to be the source of fundamental disagreements and bilateral tensions. Beijing cannot expect a warm US embrace of its international aspirations as long as it violates democratic principles at home and acts in mercenary and coercive ways abroad. But it too need not fear the United States if it is transparent about its strategic objectives and intentions, plays fair and reasonably in its pursuit of them, and is prepared to be a truly responsible stakeholder in world affairs. Paul Heer is the author of Mr. X and the Pacific: George F. Kennan and American Policy in East Asia (Cornell University Press, 2018). 3. “The Interview: Henry Kissinger,” The National Interest, September-October 2015. 4. Full text of Xi Jinping’s Report at the 19th CPC National Congress, October 18, 2017, Xinhua, http://news.xinhuanet.com/english/special/2017-11/03/c_136725942.htm; Xuan Yan, “Firmly Grasp the Promising Period of Historic Opportunities, Renmin Ribao, January 15, 2018. 5. “China Willing to Share, But Not to Export Chinese Model,” December 4, 2017, Xinhua. 6. Yang Jiechi, “The 19th CPC National Congress and China’s Major Country Diplomacy in the New Era,” Qiushi (English edition) 10, no. 1 (January-March 2018), http://english.qstheory.cn/2018-02/11/c_1122395899.htm. 7. See especially Evan Feigenbaum, “China and the World: Dealing with a Reluctant Power,” Foreign Affairs 96, no. 1 (January/February 2017). 8. See Jessica Chen Weiss, Powerful Patriots: Nationalist Protest in China’s Foreign Relations (Oxford: Oxford University Press, 2014). 9. See Alastair Iain Johnston, “How New and Assertive is China’s New Assertiveness?” International Security 37, no. 4 (Spring 2013), 7-48. 10. See Zheng Wang, Never Forget National Humiliation: Historical Memory in Chinese Politics and Foreign Relations (New York: Columbia University Press, 2012). 11. See Margaret MacMillan, Paris 1919: Six Months that Changed the World (New York: Random House, 2001), 322-44. 12. See Mark Wu, “Is China Keeping its Promises on Trade?” in The China Questions: Critical Insights into a Rising Power, eds. Jennifer Rudolph and Michael Szonyi (Cambridge: Harvard University Press, 2018). 15. For a comprehensive survey of trends in the US-China military balance, see Eric Heginbotham et al., Tallying the US-China Military Scorecard: Relative Capabilities and the Evolving Balance of Power 1996-2017 (Santa Monica: RAND Corporation, 2015); and Conflict with China Revisited: Prospects, Consequences, and Strategies for Deterrence (Santa Monica: RAND Corporation, 2017). 16. See Christopher Layne, “The US-Chinese power shift and the end of the Pax Americana,” International Affairs 94, no. 1 (January 2018). Hugh White introduced his version of this idea in “Power Shift: Australia’s Future between Washington and Beijing,” Quarterly Essay 39 (2010) and expanded on it (less persuasively, in my view) in “Without America: Australia in the New Asia,” Quarterly Essay 68 (2017). 17. See Ezra Vogel, Michael D. Swaine, David M. Lampton, Joseph W. Prueher, J. Stapleton Roy, and Paul Heer, “How America Can Lead in Asia,” The National Interest, December 12, 2016 (http://nationalinterest.org/feature/how-america-can-lead-asia-18720); and Michael Swaine, Wenyan Deng, and Aube Rey Lescure, Creating a Stable Asia: An Agenda for a US-China Balance of Power (Washington DC: Carnegie Endowment for International Peace, 2016). 18. George F. Kennan, “The Sources of Soviet Conduct,” Foreign Affairs (July 1947). Good thinking, though I would go further: China plans to lead the way its founding genius, Confucius recommended: by virtuous example because, as President Xi recently reminded everyone, “a virtuous leader is like the North Star, which stays in place while the firmament revolves around it”. Splendid essay. The world needs more rational and well-informed thinkers such as the author. The current hysteria (and, frankly, circus) that is the US political arena is very dangerous and needs some level-headed guidance. Its not like losing a little influence is the end of the world, and America cannot afford to maintain its empire much longer anyways. We need to work on friendly and mutually beneficial relationships and drop the belligerence. It is amazing that Washington even has a friend left, and in fact I think most nations just give lip service to a country that can and will use military force on very little provocation like a spoiled child. Perhaps we don’t, at the end of day, have any real friends at all, and China, with it’s relatively clear (and almost simple-minded) offerings to the world is looking better every day to most of the world that just has to be fed up with America’s trumpery (yes, that is a word that means bulls**t…sorry I couldn’t resist!). It is time for the playground bully to get some humility and grow up, and as this essay points out, I don’t think it’s a matter of choice much longer.